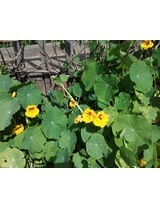 Description: Annual herb with branches to c. 50 cm long, ± succulent. Leaves peltate with lamina circular to reniform, 4–15 cm diam., margins ± sinuate, lamina glabrous, veins c. 9 and radiating from petiole; petiole 5–30 cm long. Flowers axillary, solitary; peduncle often 15–25 cm long. 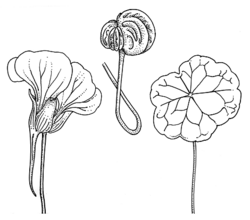 Sepals 1–2 cm long; spur 2.5–3.5 cm long, straight or curved. Corolla 2.5–7 cm diam., usually red, yellow and orange. Fruit indehiscent, c. 10 mm long. 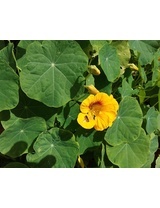 Distribution and occurrence: widely cultivated as an ornamental, naturalised in disturbed areas. Native of S America.